28 Things We Did in Bangkok Thailand & Travel Tips! 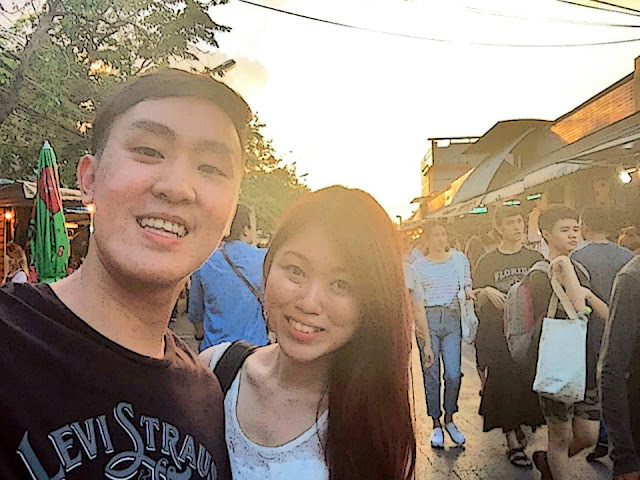 Name the place that Singaporeans love visiting the most: it's Bangkok. Or Krung Thep in Thai. At any one point, you'd have at least a friend who is about to go there, just came back, or is currently frolicking in Chatuchak for the weekend. It's almost like a garden in our backyard. 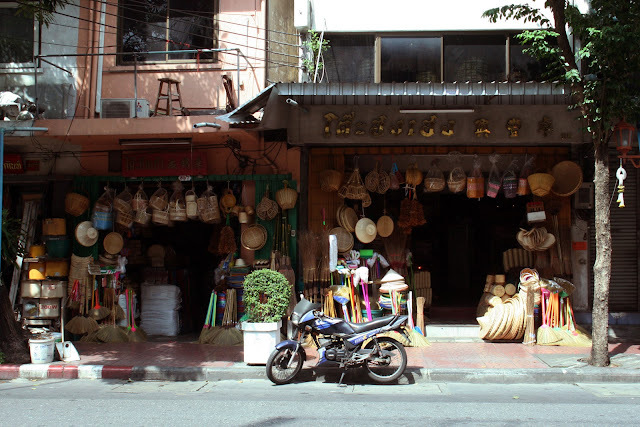 Everyone loves going to Bangkok even in 2016 - for its shopping, for its food, for its kickass massages. And for those who haven't, would be curious about what Bangkok has that keeps people from going there time and again. 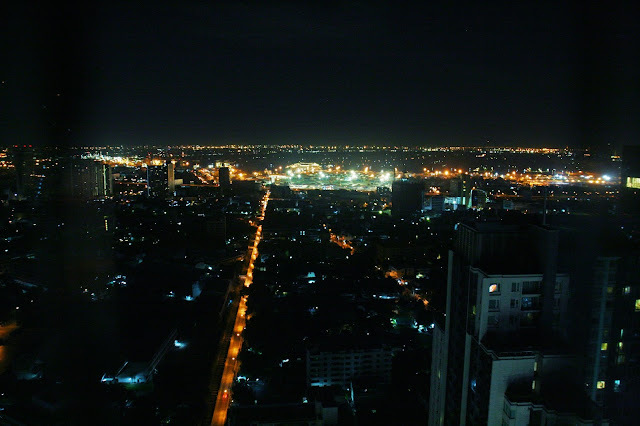 Bangkok is a fascinating metropolis that has so many surprises at every corner, and there seemed to be a crazy lot of things to do. When they say you can be done visiting Bangkok in three days, don't believe them at all! There are so many fun, interesting and off-the-beaten-path things to do that will get your heart racing - you'll at least need to stay for a month to really experience the city fully. Here is a map of all the 28 things that will be featured in this post! If you want to visit a floating market on your short getaway to Bangkok, Taling Chan floating market would be your choice. It is not too far away - only 10km, which means you won't be spending too much time on the road. Yet this charming floating market has lots to see despite its small size, with a smattering of everything - flowers, handicraft, notebooks, fruit, street food and of course, seafood. It is said to be relatively less commercialized and touristic as compared to other floating markets. It was not too crowded even though there were other tourists around as well. At the end of this floating market, you will reach the harbour where you can choose to go on a boat ride. That's also where you'll get to dig into a seafood feast on the low tables right on the floating market! Don't pull any punches as you do. 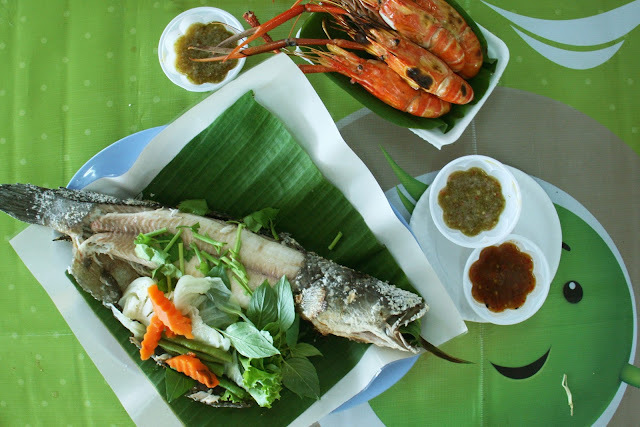 Eat those delicious prawns and fish with your bare hands to total gratification! Thai romance films' theme songs stick in your head for a long time. You don't have to understand the language to appreciate their voices and melody of the song. The sweet romance songs from Thailand is one of the memorable international features about their culture, and the way to experience it was to listen to a local band! We were introduced to this amazing live music bar restaurant by our airbnb host, just a 5 minutes walk away. After a recent renovation, Indy's has been transformed into a trendy bar with an alfresco area for diners to chill outside. 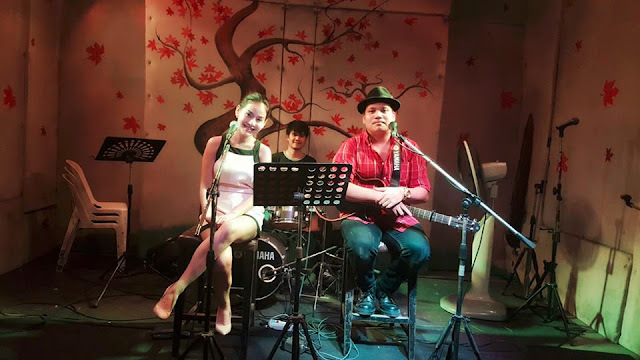 The live acoustic band plays every night between 8.30pm to 9.30pm with Thai and international songs. All while tucking into this fantastic food. 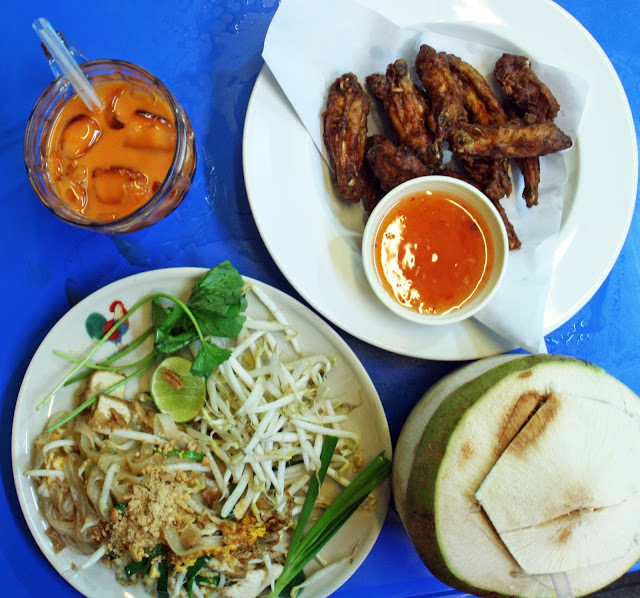 Being the first meal in Bangkok, it set the standards really high. The tom yum soup was very fragrant and rich in spices, a satisfying sour and spicy mix that will keep your tongue tingling. The pineapple fried rice and fried crab cakes totally hit the right notes as well! I only wished I could eat more to try all that Indy has to offer. Recommended place for an awesome Thai dinner! 7. Could not resist munching on some Khanom Bueang (Thai crepes)! 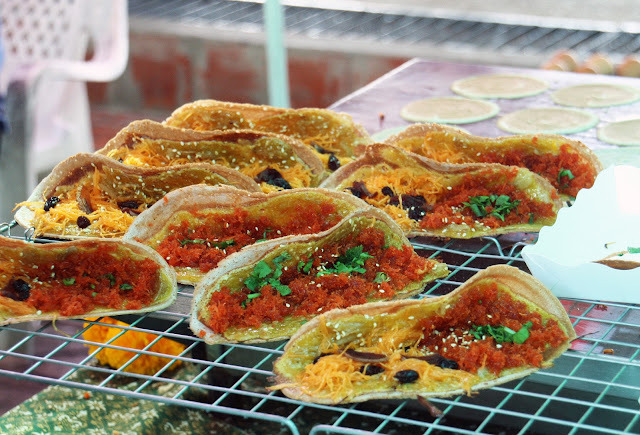 Thai crepes, or Kanom Bueang, is one of the popular street food dessert around Bangkok that we constantly spotted. It definitely appealed to the sweet tooth in me! A crispy brown crepe topped with foy thong, which could be a minced mixture of shredded coconut, shredded meringue of egg white and sugar. 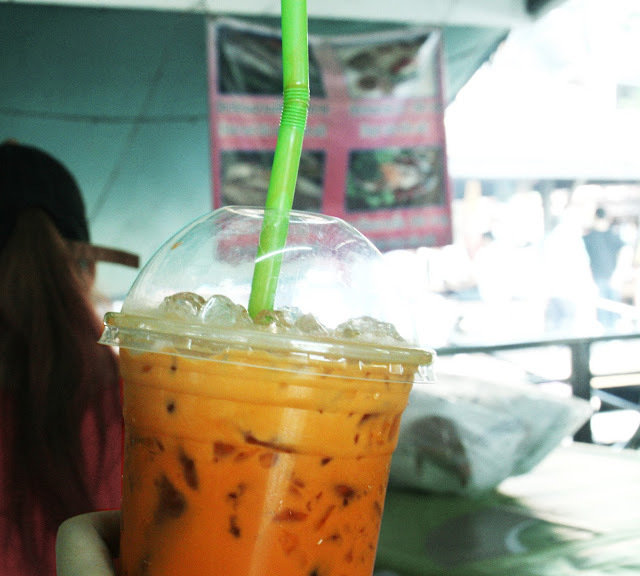 We tried this at Taling Chan floating market, but there were some at Chatuchak weekend market as well. Coconut is one of my favourite ice-cream flavours. And when at the land of coconut ice-cream, it would be absolutely blasphemous to skip this dessert! 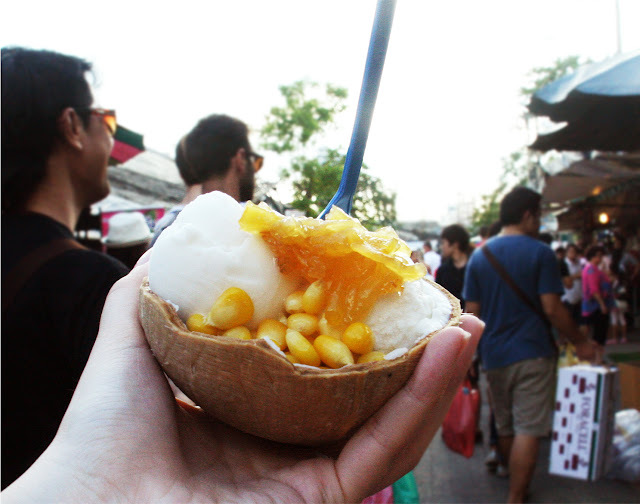 Not just as mere ice-cream scoops, peanut, red bean, corn and coconut jelly are some of the toppings that you can sprinkle atop! Based on annual mean temperatures, Bangkok is the hottest city in the world. Can you imagine that? That only makes juicing up much more satisfying... icy-cold watermelon, orange, carrot, mango fruit shakes - sometimes this city makes you believe that all the fruit juice in the world is right here too. 10. Pigged out on a sinful but delicious supper in one of the sois. Hungry o'clock can strike any time, and when it happens in the middle of the night - it only means one thing: supper! 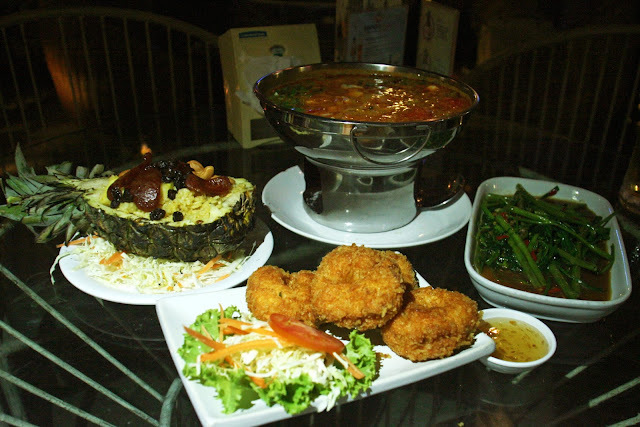 From time to time, I will still think of this wonderful supper in Soi 38. I regret none of the calories at all. Wai Traimit and Wat Pho. Located at the beginning of Yaowarat road, Wai Traimit is a gorgeous white temple right in the heart of Chinatown. Wai Traimit also houses the largest Buddha made of solid gold in the world, which is a stunner to see. Wat Pho (Temple of the Reclining Buddha), on the other hand, has a much larger temple complex with a 46m long reclining Buddha statue. It is impressive to witness as we walk around it solemnly. 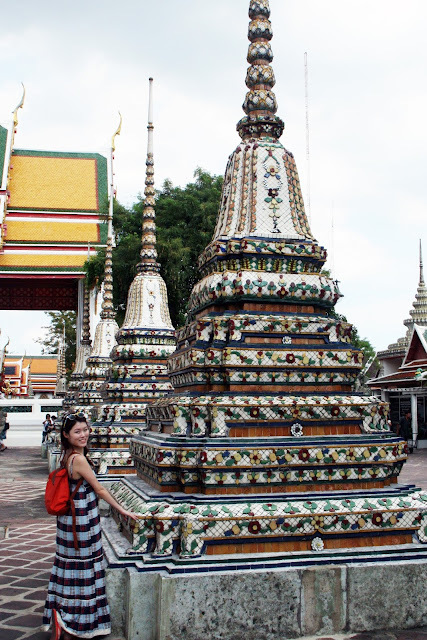 Home to nearly a hundred chedis, Wat Pho is also a place of education for both Bangkokians and visitors. Such is a dangerous affliction - if you've been to enough Chinatowns around the world, gradually you'd have a strange inclination to see every Chinatown in the world. And why not in Bangkok as well, where it is a different world: they explicitly demonstrate their love for jewellery stores, pawn shops and little mom-and-pop stores. It is easy to get lost in a reverie in here. Erawan Shrine is a queer sight to behold within the city, surrounded by tall skyscrapers and glitzy malls at the Ratchaprasong intersection. This major Bangkok landmark is smaller than expected, yet it attracts streams of believers and visitors to it. As we entered, street vendors waved flower garlands, joss sticks and gold leaves at us, asking us to buy them. 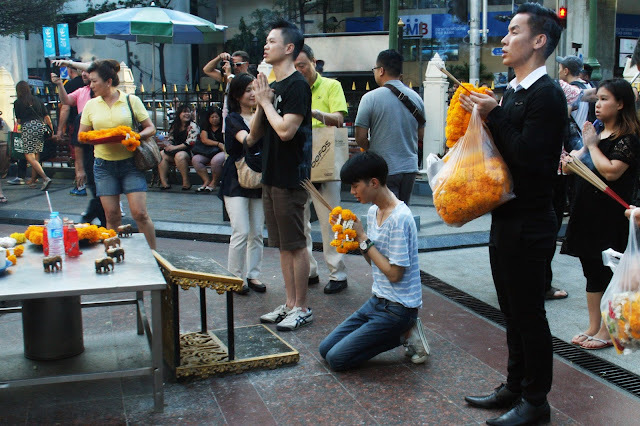 Many believe that their wishes will be especially granted at Erawan Shrine. My favourite type of meals are the most impromptu meals. 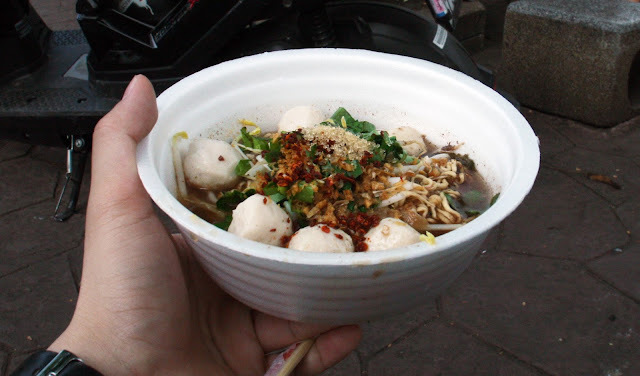 Because they happen when I'm starving: like this bowl of boat noodles sold by a street hawker. It was not the most 'hygienic' looking stall around but when hunger and intuition call out to you, the only appropriate answer is to accept it. The result? Unforgettably satisfying! 15. 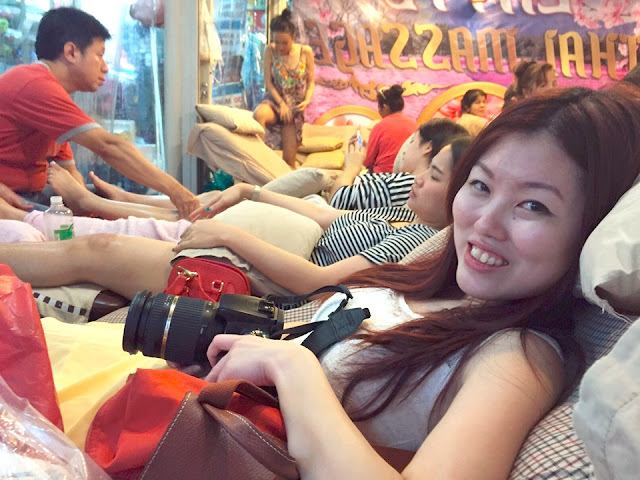 When in Thailand, do a full body Thai luxury massage. There are plenty of massage parlours around Bangkok, but if you want a certified good one with no 'special services' (y'know what I mean 💁), Health Land Spa is a decent one to go for and raved by many! 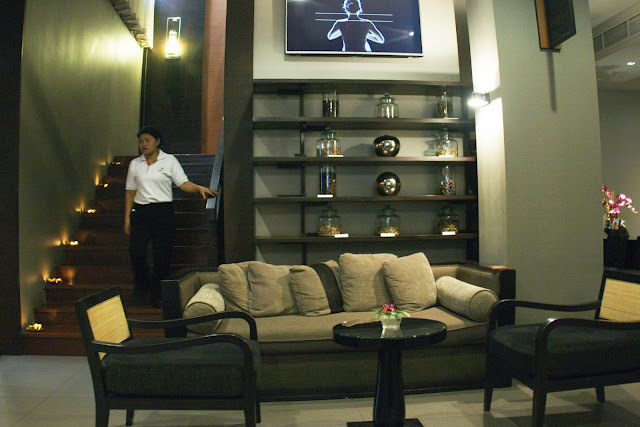 A traditional Thai massage of 2 hours, the one we went for, is priced at 550 baht. The masseur was very skillful and professional! I remembered it being extremely enjoyable that I resisted falling asleep but eventually giving in anyway. Do note that if you are planning to go to Health Land, you need to make an appointment at least 24 hours earlier to ensure you have a slot. They have 9 outlets. 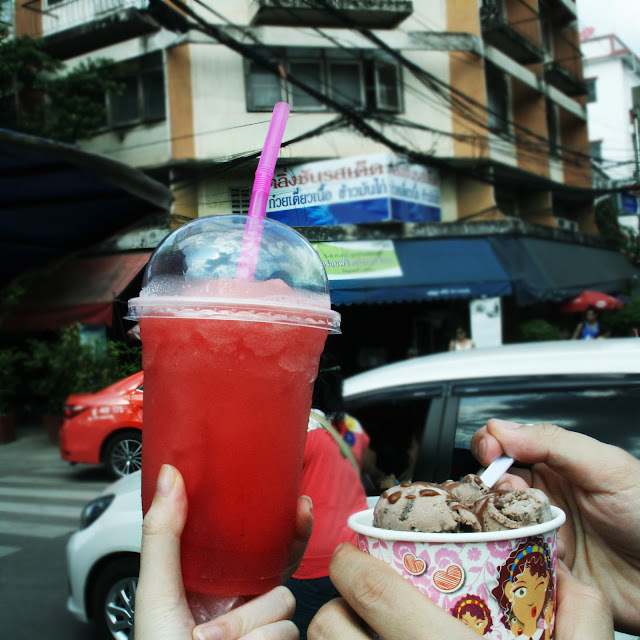 The one we went was at Asoke. 16. 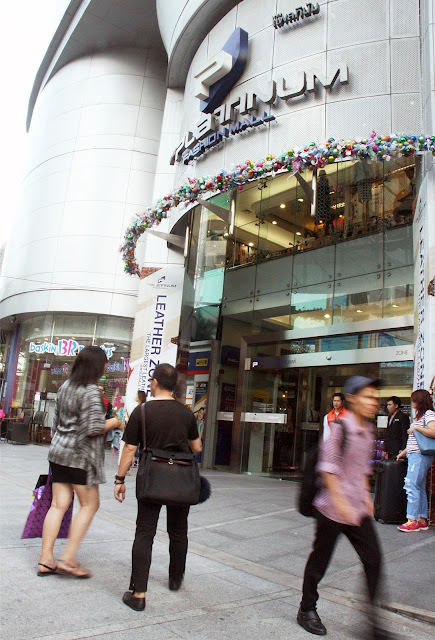 Shopped at Pratunam Mall...! 17. Food trucks for lunch! 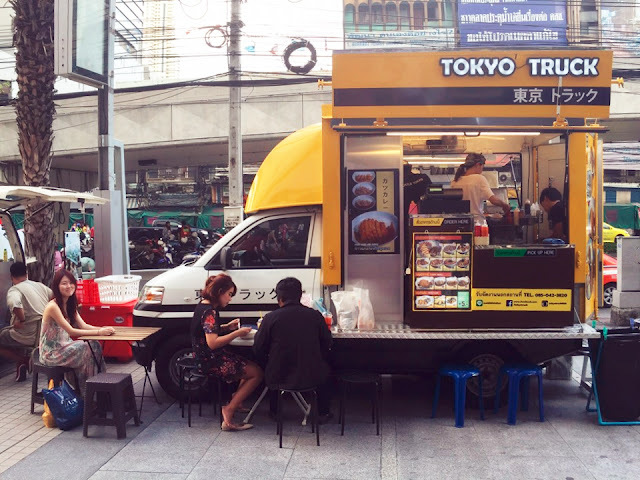 Lucky thing - we found these cool food trucks parked right outside Pratunam Mall. 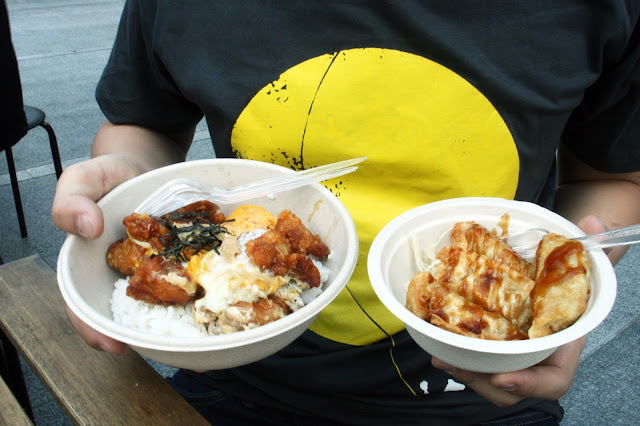 There were a couple of them, one of which is Tokyo Truck. We dug into some really good gyozas and rice bowls - I knew because I found it delicious even though I was dealing with some crazy nausea (see no.3). Witnessed locals running en masse! One of the most surprising things that we saw how enthusiastic the locals were about exercising and jogging - some of them were still in their officewear! There were older folks too, and all of them were running in Lumphini Park as if there were a marathon event at 8 in the evening. 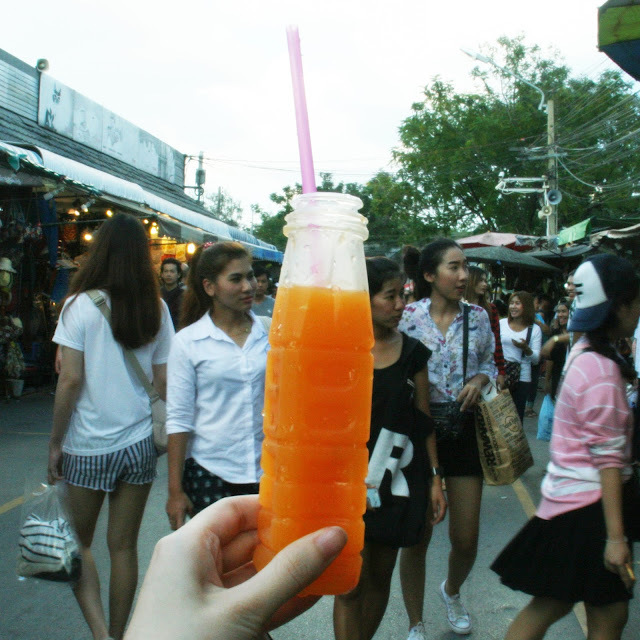 It was a slice of Bangkok that was really different from the common touristic areas. 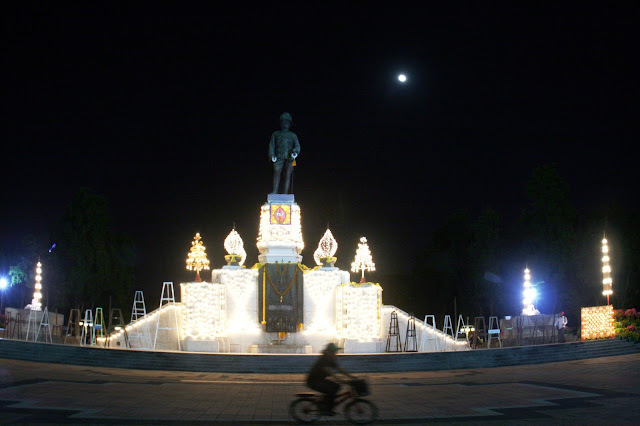 Within Bangkok, Lumphini Park is the single largest park area spanning over half a million square metres big! I know cafehopping in Bangkok points you towards The Commons, but Rocket S49 and S12 used to be really popular as well. Probably S49 more so than S12, because of its amazing architecture and interior design, while S12 is much smaller and cozier. 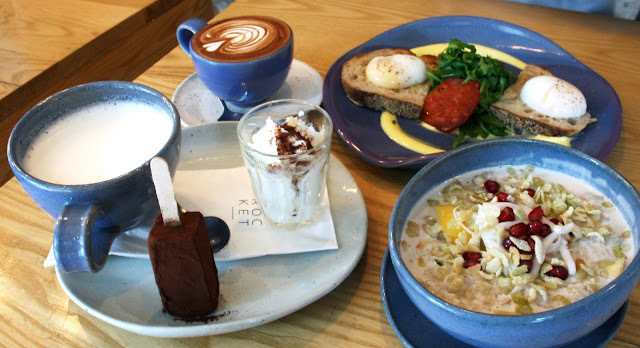 Their hipster menu selection includes hot chocolate served with a Ecuadorian cocoa stick, a large cup steamed milk, and a dollop whipped cream. When it was served, they had me in a heartbeat. 20. Looked out at the Chao Phraya river! 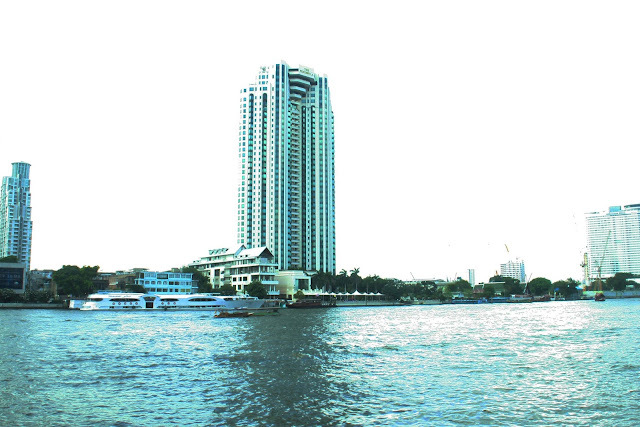 The Chao Phraya flows through nine cities, the most significant of which is Bangkok. Like most rivers, Chao Phraya played a significant role in the nurturing of human civilizations due to its abundance of fish and fertility. This view was from Mandarin Oriental, one of the most luxury elegant hotels in the city. 21. 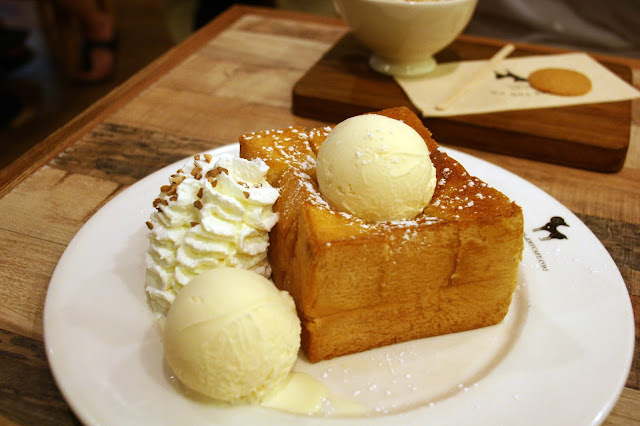 Wolfed down the famous Shibuya Honey Toast at After You. After You was probably there when people began flocking to Bangkok as their favourite weekend getaway. It has since become a staple stopover. I was just about to say 'how good can toast get' when I was proven wrong - oh my, it was really amazing. Now I understand why people go crazy over this! 22. Got addicted to Vita Milk! 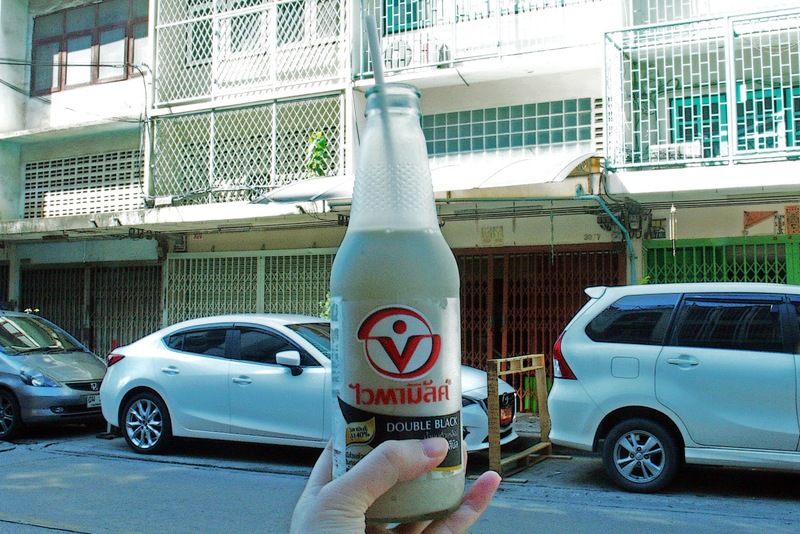 When you think about soymilk in Thailand, it's Vita Milk! It is found in their 7-11s. It's a taste that I keep going back for, it's such a thirst-quencher on super hot days. Thank goodness we found this in Singapore as well! We had this repeatedly for the umpteenth time already - I still can't decide if I like Double Black, Original or Chocolate better. 23. Climbed across railway tracks. Railway track otakus, if you're in search of a section of quiet railways tracks in Bangkok that you can climb around without much judgment - you can check out the Chuea Pleong Road section near Mae Nam Railway Station. We didn't go on it in search of railway tracks though - for the record we literally climbed over some tracks and trains because we were on the other side of the road. 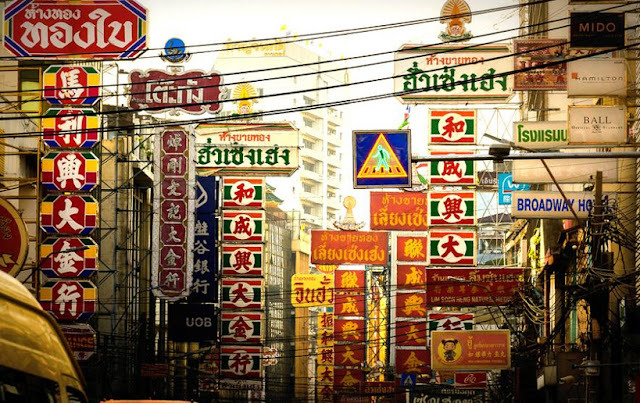 Delve deep into the underbelly of Bangkok - that is what Nana is famous for. 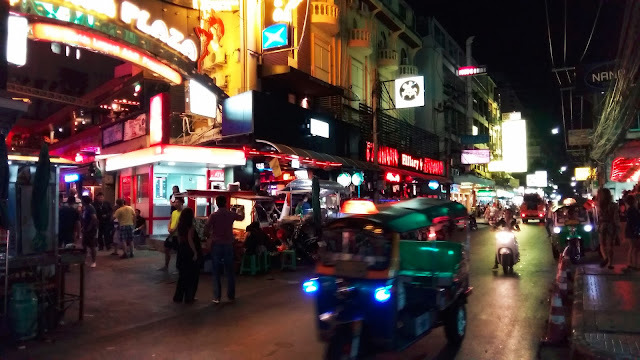 I remember the major red-light district to be glitzy, messy, full of life, people, hawkers selling many random things on the streets, and of course lady-boys and hookers walking the streets. It's an eye-opening experience! You might want to ask: is it dangerous to visit the Nana district? I did feel like it was considerably rowdier around here. I hung onto my bag which was slung in front of me and did not take any photos as I passed by - some precautions that I took. There were no incidents that made me feel at risk. Guys would actually attract more attention. 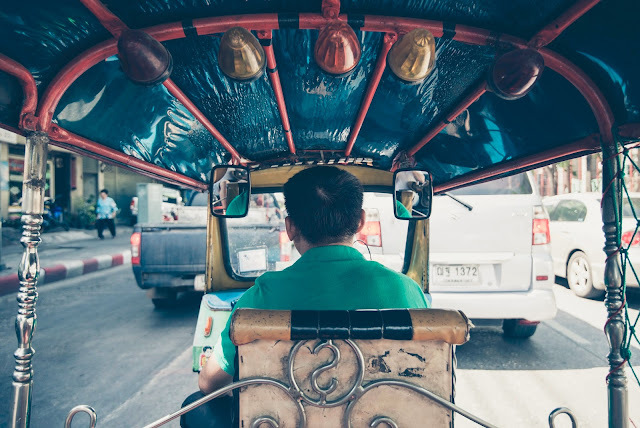 Going from place to place in Bangkok - say goodbye to cabs, tuk-tuks or walking. 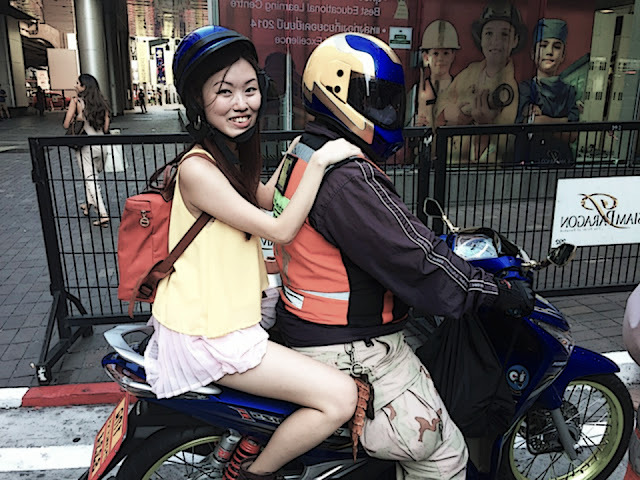 The surefire way to avoid the jam in Bangkok is to hop onto a motorbike! Other than how these motorbike riders are efficient in weaving in and out of traffic to beat the jam, it is simply exhilarating. Negotiate your fares - apparently it seems that there is a 'local' price and a 'tourist' price when it comes to motorbikes. It is almost the same price as a cab, but you get to your destination within half the duration! 26. And on a tuk-tuk! The tuk-tuk is the fun way to travel around. It certainly makes you feel special and you get to hear and feel the Bangkok traffic first-hand! Once is enough though, thank goodness we took it for a short distance, taking in the traffic fumes is no joke. 27. Stumbled upon the 'slums' of Khlong Toei. 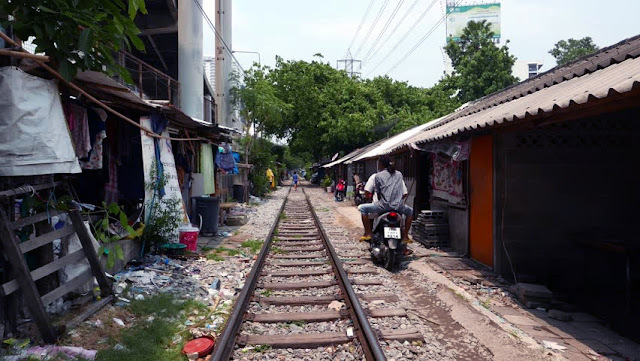 Khlong Toei is home to the biggest suburban 'slums' in Bangkok, and some of them live right on the railway tracks near Mae Nam. I only found out about this as I am writing this post, but we did stumbled upon this area when we were on our way to the BTS station. The largest and most 'local' wet market is also found in Khlong Toei - so if you are looking for a poverty-blighted district alongside budding enterprises and/or off-the-beaten track visit, this is the place to be. 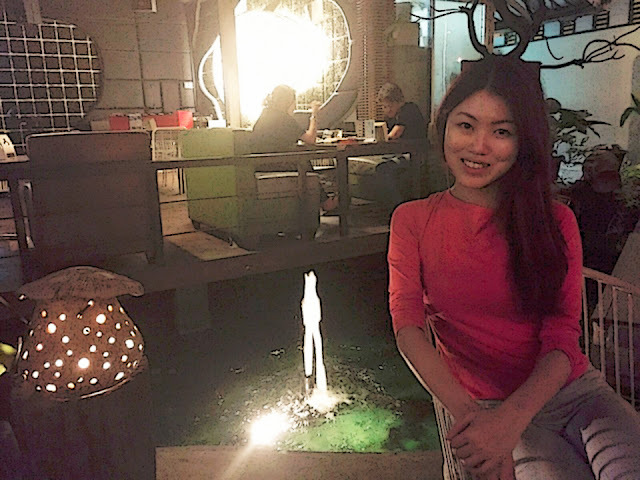 Airbnb is one of the ways to book your accommodation in Bangkok if you want something different from the usual hotels/hostels! You can get interesting views, meet amazing hosts that will tell you where to visit, and of course, preview the type of rooms that you want to live in on your holiday! There are many options on this platform at all price ranges. 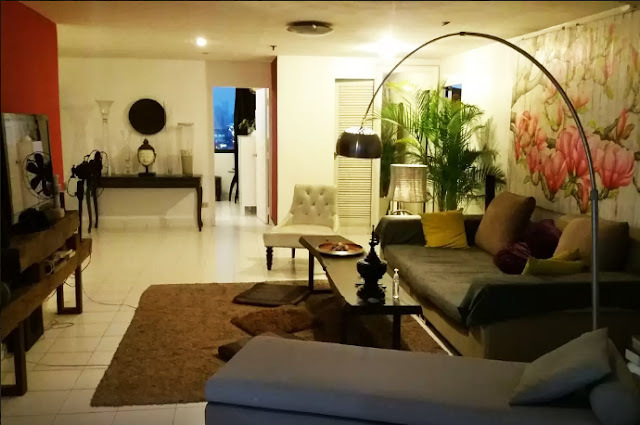 Click here to get SGD25 off on your first booking on Airbnb. This is the link to the listing that we stayed at. There are of course many more amazing activities you can do in Bangkok to make it the most memorable holiday, but that's it from me for now. Tell me your Bangkok experiences in the comments box below, I would love to hear about them!